What is Tangoe Managed Mobility Services? 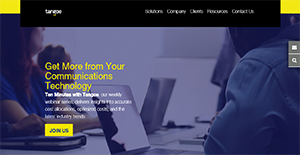 Tangoe Managed Mobility Services is an enterprise mobile device and lifecycle management solution. It aids IT departments in meeting the challenges brought about mobile devices-related issues such as tracking, securing, repairing, and more. With Tangoe Managed Mobility Services, companies can enforce strict mobile policies to ensure that their deployed devices are being used only to complete assigned tasks. The solution also assists employees in maintaining or enhancing their productivity through remote device troubleshooting and support. Tangoe Managed Mobility Services further assists companies in reducing expenses to allow them to maximize their savings opportunities. The solution enables this by letting executives and managers choose the most optimal carrier contracts and plans. With Tangoe Managed Mobility Services, end-users can instantly access work-related software and information with ease. That is because the IT department can deploy data to connected devices even remotely, to ensure the continuity of user productivity. Additionally, the solution allows device administrators to provide support to remote or on-the-go employees. This way, technical issues are resolved expeditiously to allow staff to complete their assignments in due time. Tangoe Managed Mobility Services gives enterprises the flexibility to set their custom mobile device usage rules. This lets them make certain that employees are utilizing their conferred device accordingly for work and not for idle and unproductive activities such as social media browsing and messaging. This also allows them to ensure the longevity of their devices, so they can save on mobility costs. With Tangoe Managed Mobility Services, businesses can safeguard sensitive information stored in their workers’ devices. That is because the solution applies rigorous security measures across the mobile environment for IT staff to monitor them for possible security threats. Carrier contracts can create confusion due to their variable offerings. Because of this, companies are likely to incur more expenses if they do not choose the plan most optimal for their employees. However, if they employ Tangoe Managed Mobility Services, they can manage their mobile spending better as the solution provides them with a clear view of expenditures and mobile usage. On top of that, Tangoe helps enterprises lower their carrier premiums by working with them to strategize for contract negotiations. If you are considering Tangoe Managed Mobility Services it might also be beneficial to check out other subcategories of Best Mobile Device Management Software - MDM listed in our base of B2B software reviews. Since each enterprise has unique business wants, it is prudent for them to desist from looking for a one-size-fits-all perfect software application. Needless to say, it would be useless to try to find such a system even among market-leading software solutions. The clever thing to do would be to list the various essential aspects that require consideration such as main features, finances, skill levels of staff members, company size etc. Then, you should do your research thoroughly. Read some Tangoe Managed Mobility Services reviews and check out each of the other systems in your shortlist in detail. Such in-depth homework can make sure you weed out ill-fitting platforms and zero in on the system that presents all the elements you need for business success. How Much Does Tangoe Managed Mobility Services Cost? Tangoe’s Managed Mobility Services aid enterprises in organizing, securing, and cutting costs related to their mobile infrastructures. Companies interested in the solution can request for their enterprise pricing information by phone, email, or web form. We realize that when you make a decision to buy Mobile Device Management Software - MDM it’s important not only to see how experts evaluate it in their reviews, but also to find out if the real people and companies that buy it are actually satisfied with the product. That’s why we’ve created our behavior-based Customer Satisfaction Algorithm™ that gathers customer reviews, comments and Tangoe Managed Mobility Services reviews across a wide range of social media sites. The data is then presented in an easy to digest form showing how many people had positive and negative experience with Tangoe Managed Mobility Services. With that information at hand you should be equipped to make an informed buying decision that you won’t regret. What are Tangoe Managed Mobility Services pricing details? What integrations are available for Tangoe Managed Mobility Services? If you need more information about Tangoe Managed Mobility Services or you simply have a question let us know what you need and we’ll forward your request directly to the vendor.